Few bands have ever achieved such instant acclaim as Massive Attack did on the release of their debut album, 'Blue Lines'. And even fewer bands have then managed to disappear quite so completely off the face of the planet. 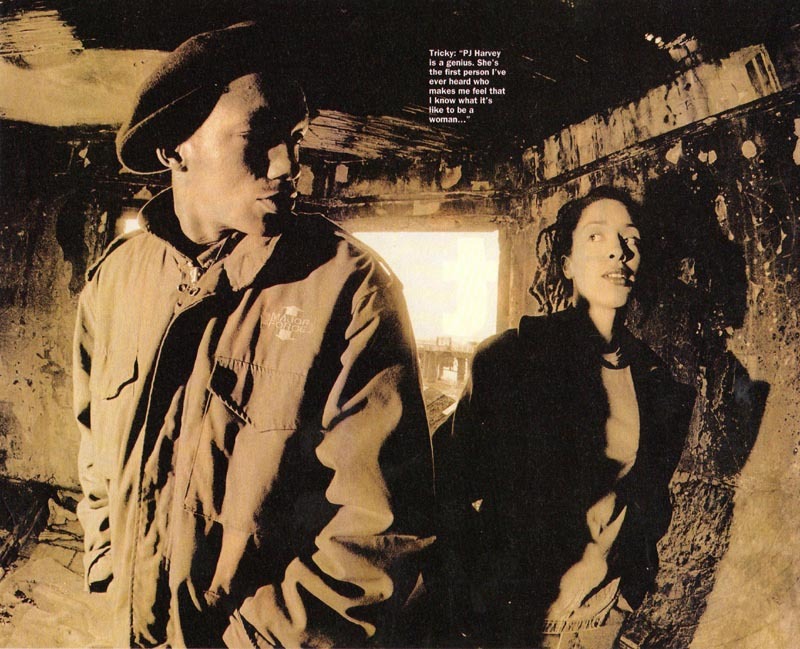 However, 1994 sees at least one comeback out of Bristolian trio with the release of the clunkingly marvellous and incredibly relaxed 'Aftermath' single from rapper Tricky (he once went by the name Tricky Kid, but presumably he's grown up since). In the Rizla stakes, it makes The Orb sound rather uptight and fractious. Poised halfway between the old-style Massive Attack sound and a whole new ball game of sampled woodwind and banging cowbells, 'Aftermath' finds the gruff-voiced rapper cantering around the mixing desk like Tom Waits on National Good Groove Day. Not that he really raps on it, you understand. Oh no. Nothing as strenuous as that. But at least it's a start. How did 'Aftermath' come about? decided to re-do it in a proper studio. I found the girl that sings on it, Martina, sittin on my garden wall when I was coming back from the shops. She's only 18 but she's got a great voice, so I let her do the single. I don't really consider myself to be a rapper. I'm more of a lyricist really." What are the single's lyrics about? "To start with they were about the end of the world. But I find it really difficult to concentrate on just one thing so I started writing about mothers and a whole lot of other stuff. So, basically it's about the end of the world. And my mother." It's been ages since there's been any Massive Attack activity. What have you all been up to? Counting the money? (Laughs) "Yeah, there has been a bit of that. We did go to America for quite a while, which was fun, and then we decided to have a holiday. After that we just seemed to keep on missing each other." But you all live in the same town. "Well, I go out a lot, you know." Are we ever going to hear from Massive Attack again? "Oh sure. The others are in the studio at the moment. I've written a track called 'Kharma Coma' which we've finished, and there two or three other songs that are done." Will it be very different to 'Blue Lines'? "No, not different. Just better." "No... Like, someone who've I really fallen for recently is PJ Harvey. I think she's a genius. She's the first person I've ever heard who makes me feel that I know what it's like to be a woman. If I had the choice of working with anyone in the world then it would be her." Well you are both signed to the same record company. Maybe this time next year we could be talking about a PJ/Tricky duet? "No way, man. It would have to be a whole album or nothing." Mr. Albini, you have been warned.